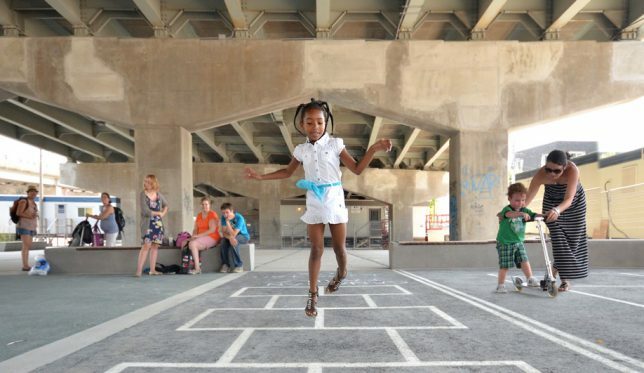 Climbing walls, skate parks, art installations, theaters and even miniature marinas take advantage of the cathedral-like spaces beneath highways and bridges, revitalizing formerly disused and depressed square footage in urban areas. 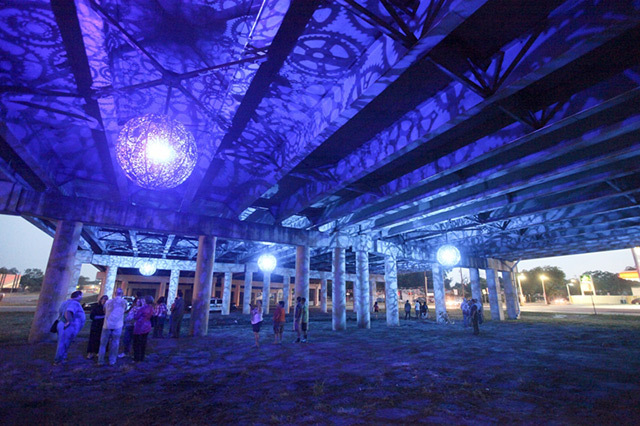 In cities around the world, underpasses are often fenced off, strewn with trash and generally unappreciated, but these intervention projects reclaim the space in fun and creative ways that benefit the community. 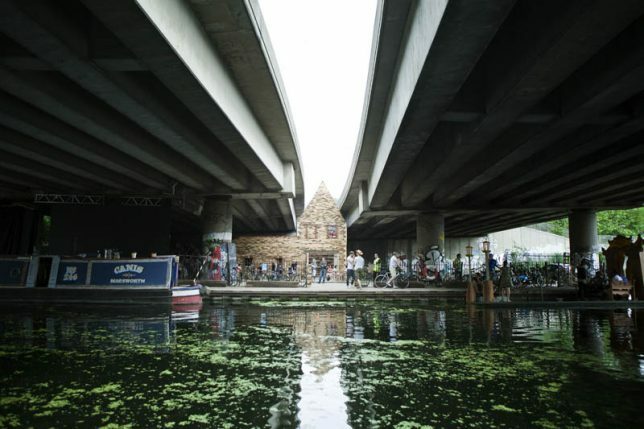 “Starting with the idea that how spaces are imagined is often as important as their physical characteristics in determining their use, the Folly reclaimed the future of the site by re-imagining its past,” says ASSEMBLE of its ‘Folly for a Flyover’ installation beneath a disused motorway underpass in Hackney Wick. 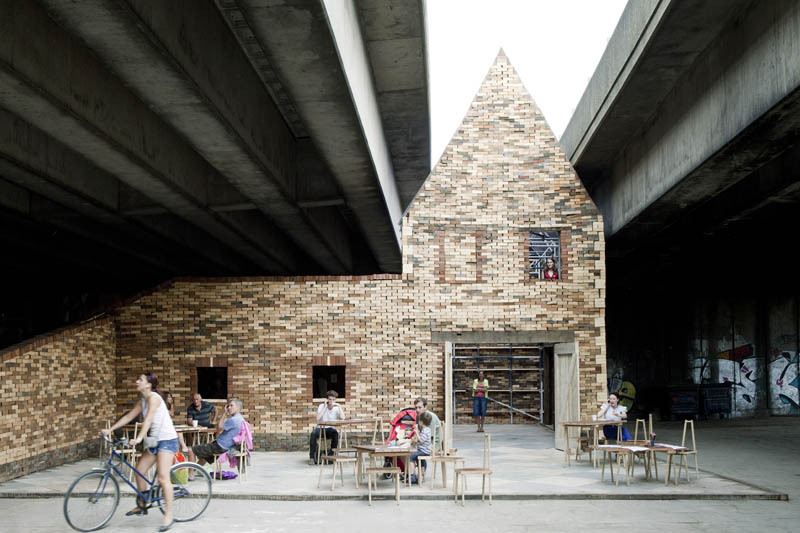 “The new ‘fairy tale’ for the site described the Folly as the home of a stubborn landlord who refused to move to make way for the motorway, which was subsequently built around him, leaving him and his pitched roof stuck between the East and Westbound lanes. 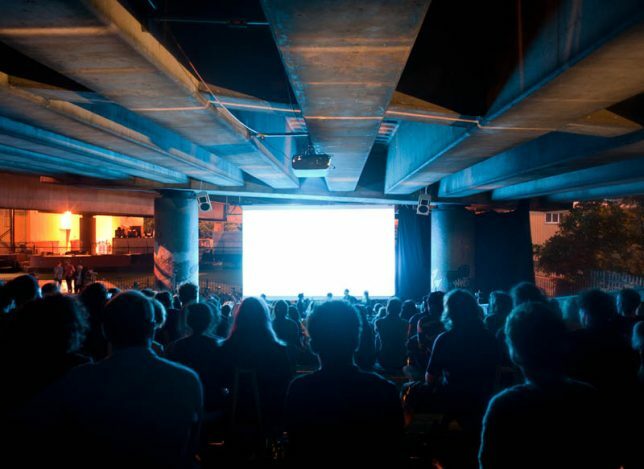 The Folly hosted an extensive program of cinema, performance and play… by day the Folly hosted a cafe, events and boat trips exploring the surrounding waterways; at night, audiences congregated on the building’s steps to watch screenings, from blockbusting animation classics to early cinema accompanied by a live score. 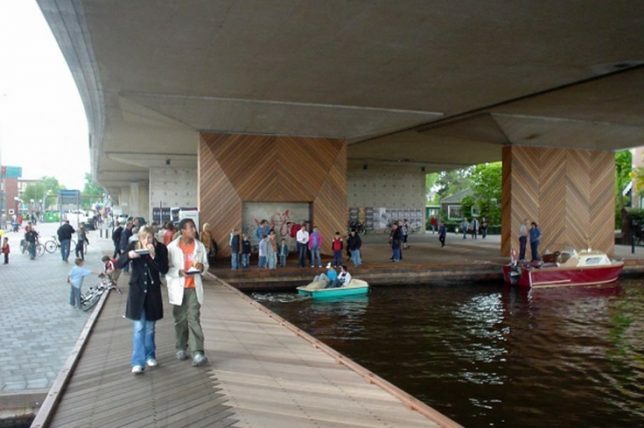 Another underpass project offering access to the adjacent waterway is A8ernA by NL Architects, located on the river Zaan in the Zoog aan de Zaan village near Amsterdam. 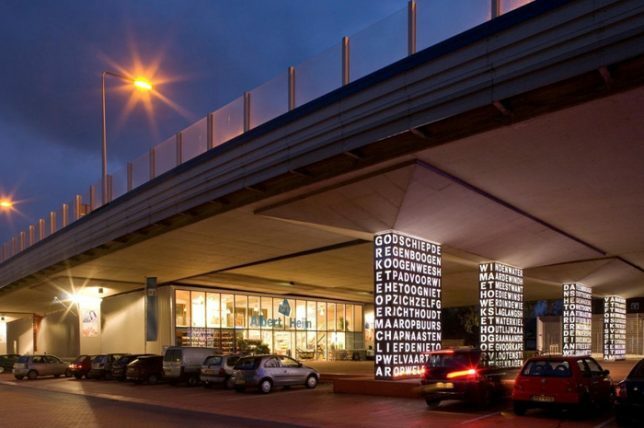 The architects describe the new highway, built on columns, as a “brutal cut in the urban tissue.” Their installation attempts to heal this cut while taking advantage of the cathedral-like space, creating an “optimistic intervention” encouraging a new type of urban life, and includes a supermarket, flower and fish shop, parking, a park and a ‘graffiti gallery.’ There’s also a skate bowl, a mini-marina, a soccer field and a small hilly park. 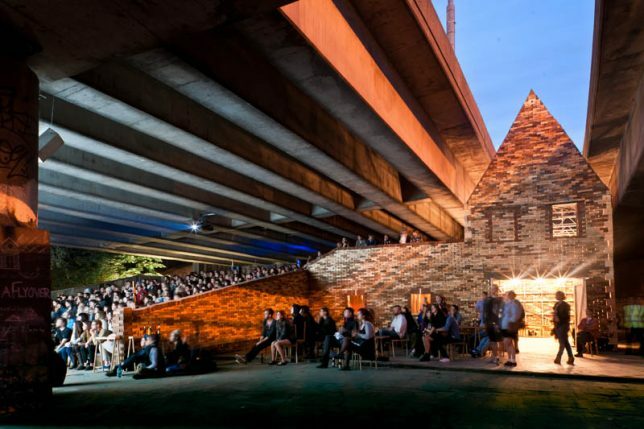 Toronto’s Underpass Park is not only the most extensive park to ever be built beneath an overpass in Canada, but one of the most unusual parks of its kind throughout the world. 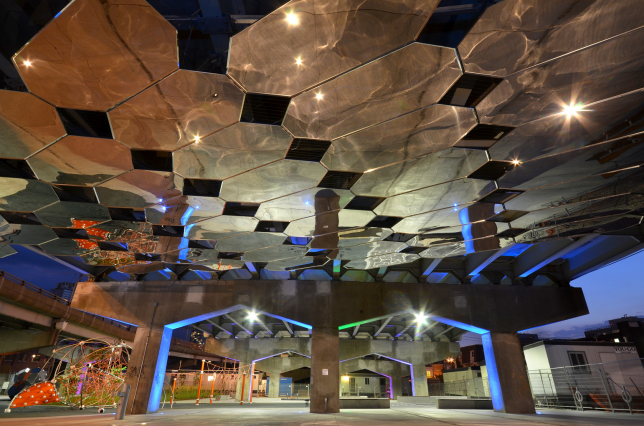 Transforming a derelict and underused space into a new urban neighborhood feature and pedestrian passageway, the park turns what was formerly a barrier between the north and south parts of the community into a connection. 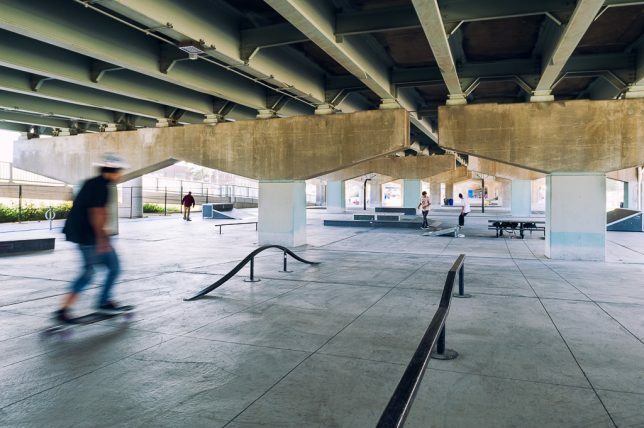 Murals by world-renowned graffiti artists, playgrounds, sculptural installations, sports fields and other amenities draw locals in to engage with the space on an unprecedented level. 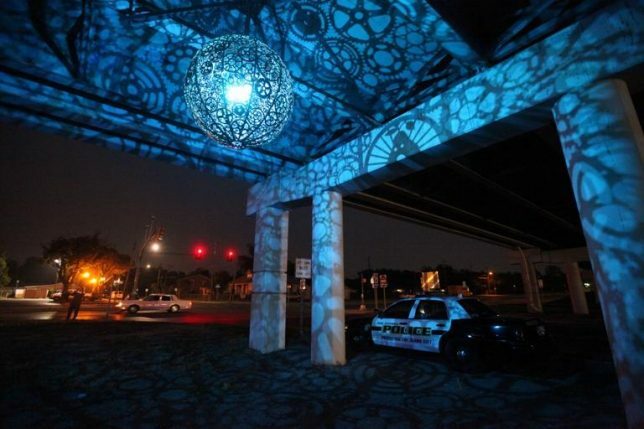 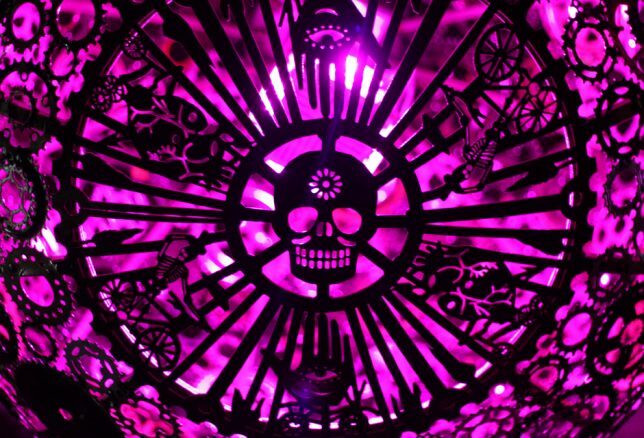 The I-35 freeway underpass in San Antonio briefly became ‘Ballroom Luminoso’ thanks to a public art installation by JB Public Art, featuring six color-changing chandeliers made of recycled bicycle parts and sprockets. 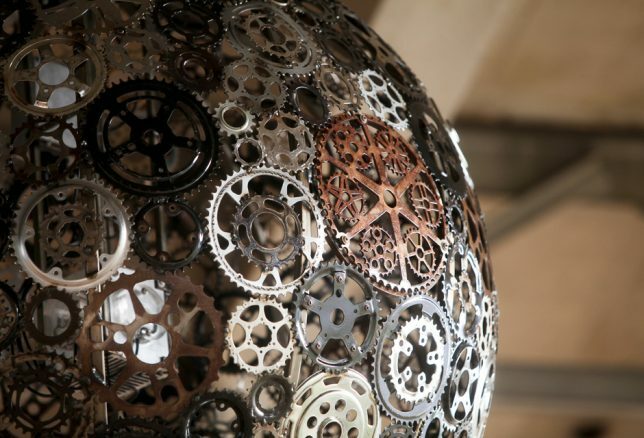 After dark, the lanterns would light up, casting intricate gear-shaped shadows all over the concrete structure. 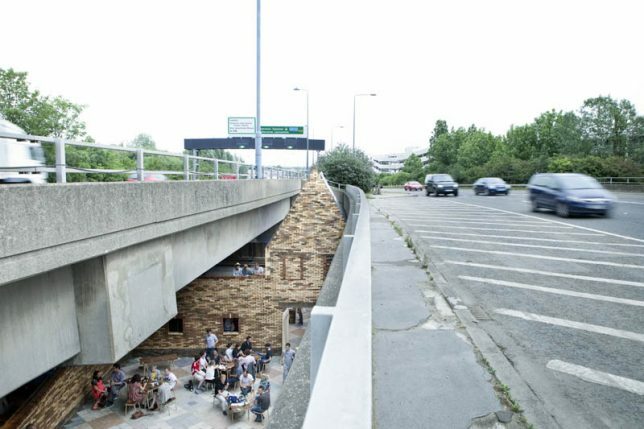 Frequently popping up in movies and television shows set in Seattle, the Fremont Troll is a public sculpture by four local artists set beneath a bridge in the Fremont neighborhood. 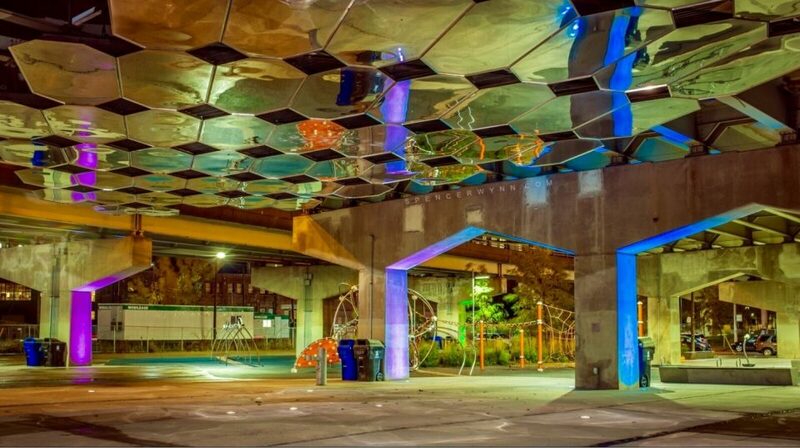 The piece won a neighborhood competition in 1990 as an idea to revitalize what was, at the time, a dumping ground. 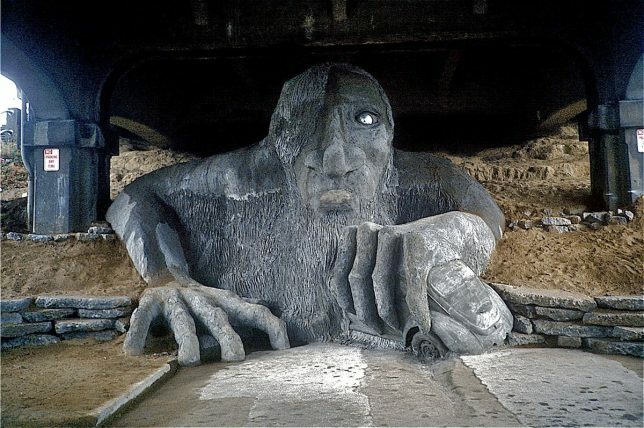 The troll sculpture is clutching an actual Volkswagen Beetle.